Experimental pop is pop music that cannot be categorized within traditional musical boundaries or which attempts to push elements of existing popular forms into new areas. It may incorporate experimental techniques such as musique concrète, aleatoric music, or eclecticism into pop contexts. Often, the compositional process involves the use of electronic production effects to manipulate sounds and arrangements, and its settings may combine sound-based work and note-based work, though not always simultaneously. The music developed concurrently with experimental jazz as a new kind of avant-garde, with many younger musicians embracing the practice of making studio recordings along the fringes of popular music. By the late 1960s, highly experimental pop music, or sounds that expanded the idea of the typical popular song, was positively received by young audiences. Throughout the ensuing decades, some purveyors of the style shared a literary-experimental tradition that balanced experimentation with populist cohesion. Some tendencies among artists include the incorporation of experimental techniques such as musique concrète, aleatoric music, or eclecticism into pop contexts. Often, the compositional process involves the use of electronic production effects to manipulate sounds and arrangements. According to musicologist Leigh Landy, experimental pop settings combine sound-based work and note-based work, though not always simultaneously. Composer Nico Muhly described the world of experimental pop as "celebrations of sonic juxtapositions". Joe Meek's 1960 EP I Hear a New World is described by the online publication Fact as an "experimental pop classic" that fused "jolly jug band pop and electronic tomfoolery". Bill Martin wrote that experimental pop developed at roughly the same time as experimental jazz,[nb 1] and that it emerged as "a new kind of avant-garde" made possible by the historical and material circumstances of its time. According to author Mark Brend, I Hear a New World (1960) by English record producer Joe Meek predates better-known experimental pop by several years,[nb 2] whereas musicologist Leigh Landy names the American composer Frank Zappa as one of the first experimental pop musicians. Musician David Grubbs writes that many younger musicians "moved out of [John] Cage's shadow by taking to a different extreme and embracing the practice of making studio recordings of works along the fringes of popular music". Grubbs further explains that some of the most prominent avant-garde musicians who formed rock bands in the mid 1960s were the Welsh John Cale (later of the Velvet Underground) and the American Joseph Byrd (later of the United States of America), who both went on to create albums of experimental pop music. However, a "gulf" would still exist between experimental composers and "out-there" pop musicians, partly due to the role of the recording studio. Regarding this, composer Robert Ashley is quoted in 1966; "We can't be popular musicians, where the fairly exciting things happen. [...] The one thing I like about popular music is that they record it. They record it, record it, record it, record it! The astute producer cuts out the magic from the different tapes (laughter) and puts them in a certain order and gets a whole piece. It's very beautiful, because it's really aural magic. [...] We have to invent social situations to allow that magic to happen." Music historian Lorenzo Candalaria described American rock band the Beach Boys as "one of the most experimental and innovative groups of the 1960s." 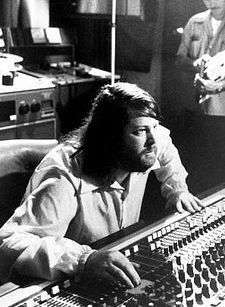 Co-founder and leader Brian Wilson wrote and produced songs for the group that ranged from massive hits to obscure experimental pop compositions. [nb 3] Their 1966 single "Good Vibrations", also produced and co-written by Wilson, topped record charts internationally, subsequently proliferating a wave of pop experimentation with its rush of riff changes, echo chamber effects, and intricate harmonies. [nb 4] It was followed by Smiley Smile (1967), an album of stripped-down recordings. In 2003, Stylus Magazine wrote that the album "embrace[d] the listener with a drugged out sincerity; a feat never accomplished by the more pretentious and heavy-handed psychedelia of that era. It is for this reason Smiley Smile flows so well with the more experimental pop of today". Author Pascal Bussy wrote that German krautrock groups such as Can and Kraftwerk successfully bridged the gap between experimental and pop music in the 1970s,  while according to The New York Times, Kraftwerk refined an "experimental pop sensibility" on albums such as Radio-Activity (1976) and Trans-Europe Express (1977). Writer Owen Hatherley located a "literary-experimental pop tradition" running throughout the United Kingdom during the 1970s and 1980s. Embodied by artists such as Roxy Music, the Smiths, the Associates, and Pet Shop Boys, this tradition "balanced sexuality and literacy, ostentatious performance and austere rectitude, raging ambition and class resentment, translating it into records balancing experimentation with populist cohesion." The 1970s work of ex-Roxy Music member musician Brian Eno is cited by Leigh Landy as an archetypal example of a pop musician who "applied developments from the experimental sector while creating their own experimental pop sector." Following his departure from Roxy Music in 1973, Eno began releasing a series of solo albums where he simultaneously developed his ambient, pop, and electronic styles. In the belief of pop musician Scott Miller, they were the era's "most successful" experimental pop artists, explaining that the key to Eno's success "appears to have been making a science out of decision points (see 'Oblique Strategies') rather than being willfully weird or different at the usual unexamined decision points"[nb 6] Joshua Pickard of publication Nooga profiled Eno's album Before and After Science (1977) as a record of "experimental pop lucidity [...] the culmination of sound that Eno had been working on since the release of Here Come the Warm Jets in 1973." Members of Roxy Music, Free, Fairport Convention, Can and Cluster feature on the record as session musicians in addition to Phil Collins, who performs drums on one track. Collins' own debut solo single "In the Air Tonight" (1981) has been described by Gary Mills of The Quietus as being "at the vanguard of experimental pop" when it was released. He further called it "a rock oddity classic" which was influenced by "the unconventional studio predilections of Brian Eno and Peter Gabriel". Landy noted the tendency of experimental pop artists such as Eno and David Byrne to build tracks around existing recordings, effectively fusing different styles, a technique used on the duo's 1981 album My Life in the Bush of Ghosts. The New York Times' Will Hermes names Laurie Anderson an experimental pop pioneer whose signature song "O Superman" (1981) was a "left-field new wave hit" that "conflated maternal succor with the psychology of the modern corporate state using electronically processed verse." Writing for The Guardian, Jason Cowley described British singer-songwriter Kate Bush as "an artist superbly articulate in the language of experimental pop music". Paste Magazine credited My Bloody Valentine's 1988 album Isn't Anything with showcasing an experimental pop aesthetic, which drew on "harsh, swirling guitar tones and beautifully dissonant distortion," that would eventually develop into the genre known as shoegazing. Martin suggested that hip hop music, particularly released by artists such as Public Enemy and KRS-One, emerged as a new form of experimental pop, seeing a renewed merger of artistic and political innovation. Icelandic singer Björk, who began her solo career in the 1990s, has been called "the queen of experimental pop" by The Guardian's Michael Cragg. In a review of Animal Collective's album Strawberry Jam (2007), Evan L. Hanlon wrote that "'experimental pop' is a pretty specious term, but when dealing with a band like Animal Collective [...] it's necessary [...] [they are] one of the only bands that takes [Brian] Wilson's influence to heart and then expands on it, pushing the conventions of pop music to their outer limits." ↑ In the chapter "Free Jazz and Experimental Jazz" of Music USA: The Rough Guide, the term "free jazz" is traced to the experimentations of a few musicians from Los Angeles in the late 1950s. Experimental jazz proceeded to become more "eccentric" over the next decade. ↑ In 2014, Meek was ranked the greatest producer of all time by NME, elaborating; "Meek was a complete trailblazer, attempting endless new ideas in his search for the perfect sound. [...] The legacy of his endless experimentation is writ large over most of your favourite music today." His reputation for experiments in recording music was acknowledged by the Music Producers Guild, who found "The Joe Meek Award for Innovation in Production" in 2009 as an "homage to [the] remarkable producer's pioneering spirit". The first artist inaugurated was Brian Eno. ↑ New York magazine referred to the albums Pet Sounds (1966) and Smiley Smile (1967) as the group's "experimental pop phase", while Sean O'Hagan of the High Llamas named Wilson "the most experimental pop pioneer of our time [...] The same way Sun Ra was utilizing those ideas in the '60s, those guys [Wilson and collaborator Van Dyke Parks] were actually playing around with pop experimental music". NME ranked Wilson number eight in its "50 Greatest Producers Ever" list, describing his mid 1960s productions as "groundbreaking" and underheralded. ↑ AllMusic's John Bush compared the song's fragmented style to the cut-and-paste methods of experimentalist William S. Burroughs, continually switching between partially related sections, and challenging traditional verse-chorus-verse standards. ↑ Their 1967 single "My World Fell Down" only reached number 70 on national charts, though critic Richie Unterberger considers it "one of the great experimental pop-psych gems of the era [...] sounding very much like a lost Beach Boys classic from the 'Good Vibrations' / Smile era." ↑ Journalist Andrew Marantz wrote that "his four experimental pop albums from the mid-1970s were universally revered and have influenced generations of indie rockers." Author Bill Martin credits Eno as the most important catalyst for "post-progressive" rock, explaining that the albums merged "warped aspects of progressive rock" with "a strange premonition of punk" and "the first approximations of new wave". 1 2 3 Landy 1994, p. 100. 1 2 3 Johnson 2009, p. 200. 1 2 3 Martin 2015, pp. 4–5. 1 2 Johnson 2009, p. 199. 1 2 Landy 2012, p. 14. ↑ Muhly, Nico. "Walls come tumbling down". The Guardian. Retrieved 25 August 2016. ↑ Fact (February 28, 2013). "Joe Meek's experimental pop classic I Hear A New World gets expanded reissue". Fact. ↑ Unterberger, Hicks & Dempsey 1999, pp. 14–15. ↑ Brend 2005, p. 55. 1 2 "The 50 Greatest Producers Ever". NME. July 23, 2014. ↑ "Brian Eno wins the first Joe Meek award". Audioprointernational.com. Retrieved 27 October 2009. 1 2 Grubbs 2014, p. 61. ↑ Grubbs 2014, p. 62. ↑ Candelaria 2014, p. 130. ↑ New York. New York Magazine Company. 1998. 1 2 3 Pederson, Erik (1997). "What the World Needs Now: The New Easy Listening". Option (77). 1 2 John, Bush. "Review". AllMusic. Retrieved November 16, 2014. ↑ Faust, Edwin (September 1, 2003). "The Beach Boys - Smiley Smile/Wild Honey". 1 2 Chapman 2012, p. 113. ↑ Palacios 2010, p. 159. ↑ Paraeles, Jon (July 12, 2006). "Syd Barrett, a Founder of Pink Floyd, Dies at 60". The New York Times. ↑ Early 2001, p. 4. ↑ Densmore 2009, p. 184. ↑ Martin 2015, p. 4. 1 2 Murray, Noel (April 7, 2011). "Gateways to Geekery: Sunshine Pop". The A.V. Club. Onion Inc. Retrieved November 27, 2015. ↑ Bogdanov, Woodstra & Erlewine 2002, p. 971. ↑ Bussy 2004, p. 39. ↑ Rubin, Mike (December 4, 2009). "Who Knew That Robots Were Funky?". The New York Times. 1 2 Hatherley, Owen. "Pulp matter more than ever in today's cowed popcultural landscape". The Guardian. Retrieved 18 July 2016. 1 2 3 Pickard, Joshua (October 10, 2015). "Record Bin: The experimental pop lucidity of Brian Eno's "Before and After Science"". Nooga. ↑ Miller 2010, p. 69. ↑ Marantz, Andrew (December 31, 2012). "Finding Eno". Mother Jones. ↑ Martin 1998, p. 251. ↑ Mills, Gary (26 May 2010). "No Flak Jacket Required: In Defence Of Phil Collins". The Quietus. Retrieved 23 October 2015. 1 2 Landy 1994, p. 44. 1 2 Hermes, Will (June 25, 2010). "Electronic Expressions in the Service of the Soul". The New York Times. 1 2 Cowley, Jason. "Kate Bush, Aerial". The Guardian. Retrieved 30 June 2016. ↑ Jackson, Josh (February 1, 2012). "The 80 Best Albums of the 1980s". Paste. 1 2 Martin 1998, p. 6. ↑ Hanlon, Evan L. (September 27, 2007). "Animal Collective "Strawberry Jam" (Domino) - 5 stars". The Harvard Crimson. 1 2 Chuter, Jack (November 2015). Storm Static Sleep (PDF). Function. ↑ "Animal Collective: The Electronic Turns Organic". NPR Music. January 21, 2009. ↑ Cook-Wilson, Winston (September 8, 2015). "'Live at 9:30' Finds Animal Collective Embracing Their Inner Grateful Dead". Inverse. ↑ Staff. "Ariel Pink's Haunted Graffiti "Round and Round"". Exclaim!. Retrieved 12 July 2016. ↑ Davies, Jon. "Nat Baldwin Reviewed". The Double Negative. Retrieved 18 July 2016. ↑ Kellman, Andy. "White Car in Germany - The Associates: Song Review". AllMusic. Retrieved 18 July 2016. ↑ Landy 1994, p. 4. ↑ Walters, Barry. "Review: David Bowie's 'Blackstar' Is Adventurous To The End". NPR. Retrieved 12 July 2016. ↑ Winkie, Luke. "WHEN DID THE WORLD GET SMART ENOUGH TO LIKE DIRTY PROJECTORS?". Noisey. Retrieved 12 July 2016. ↑ Rodriguez, Krystal. "Grimes Made "A Mix of Weird Stuff" for BBC Radio 3's 'Late Junction' Show". Vice Media. Retrieved 21 August 2016. ↑ Britton, Luke Morgan. "Grimes 'halfway done' with 'chill, synthy' new record". New Musical Express. Retrieved 21 August 2016. ↑ Weingarten, Christopher R. "Hear Faith No More's First Release in 17 Years, 'Motherf---er'". Rolling Stone. Retrieved 18 July 2016. ↑ ""It Means I Love You" (MP3 file)". Stereogum. Retrieved 2016-06-28. ↑ Fitzmaurice, Larry. "Julia Holter". Pitchfork Media. Retrieved 18 July 2016. ↑ Cheves, Olivia. "LISTEN: Micachu & The Shapes - Oh Baby". The Quietus. Retrieved 18 July 2016. ↑ Ben Kaye. "Panda Bear's video for "Crosswords" is a one-man kaleidoscopic dance party — watch". Consequence of Sound. Retrieved 2016-02-18. ↑ "Panda Bear Meets the Grim Reaper". The Irish Times. Retrieved 2016-02-18. ↑ Holden, Stephen. "Star in Pursuit of the Primal". The New York Times. Retrieved 12 July 2016. ↑ Leahey, Andrew. "Sleigh Bells". AllMusic. All Media Network. Retrieved February 14, 2016. ↑ Day, Laurence. "SOPHIE reveals piercing new single "L.O.V.E."". The Line of Best Fit. Retrieved 12 July 2016. ↑ Cole, Matthew. "Album Review: Stereolab - Not Music". Slate Magazine. Retrieved 12 July 2016. ↑ "Indie electro, cybercore ja psühhedeelne vibe @ TMW" (in Estonian). www.postimees.ee. Retrieved 2016-09-01.